Client Feature: Ponderlily — BRANDPOLISH CO. The Founder, Carina Lawson, was a busy executive and twin mom, who was seeking a more balanced lifestyle for herself where she could make space for meaning and pursue those things that filled her up and inspired her. She’s a go-getter, so part of making meaning in her life became creating a collection of products for people with full lives to start living more intentionally. The Ponderlily Planner (and so much more) was born! When Carina first came to me, she found me through mutual entrepreneurial friends and she already had a well-established brand. She had a wonderful brand strategy in place and gorgeous products, but was a little stuck in how the brand was showing up, both visually and through her messaging. WHY WORK WITH HILARY IF YOU ALREADY HAD A BRAND STRATEGY IN PLACE? CL: I was at a crossroads defining our key brand colors for a web project. The colors of our recent rebrand weren’t resonating with our customers and this was showing up on our sales figures. I also wanted to run my thoughts on the matter by someone outside of the ‘agency’ business to see if they made sense. WHAT DID YOU TAKE AWAY AS YOUR MOST VALUABLE A-HA? CL: The biggest a-ha moment was working through our messaging to deliver crystal clear direction on how our brand assets are used, including photography. As a product-based business and being quite shy myself, I had a hard time making myself part of the brand. I walked away from our sessions with a lot of excitement, hope, and clear direction of how I can show up to support our customers, create a community in a way that sits well with me, and shine a light on Ponderlily as a resource to our customers. TELL US THE MISSION AND MEANING BEHIND PONDERLILY. 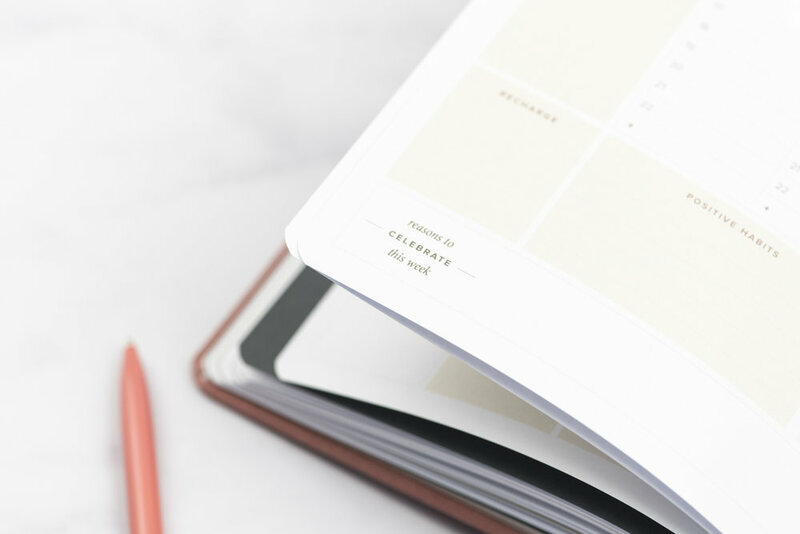 CL: Ponderlily is an ecofriendly stationery and lifestyle brand that believes in giving women who are multi-tasking mavens the tools they need to live more intentionally and find meaningful time to recharge while doing all the things they love. We’re on track to fulfill this mission by featuring women who are multi-tasking mavens on our blog, I created a signature workshop entitled, “Making Space for Meaning” ® where I present techniques on how living with intention and making time for what matters most can look like in different seasons of life. I’m really excited for what’s next! AFTER REFINING YOUR BRAND, WHAT ARE YOU MOST EXCITED ABOUT? CL: I’m so excited to build a community with our brand and create meaningful products for them. I’m also extremely excited about dreaming ‘what could be’ with Ponderlily again. HOW HAS IMPLEMENTING YOUR BRAND STRATEGY CREATED TANGIBLE RESULTS? CL: Our sales increased and our clients were engaging with us more than before. I created a course and people showed up. I can also provide feedback on product samples with a lot more certainty and ease. It’s a great feeling! WHAT DO YOU WANT OTHERS TO KNOW ABOUT WORKIING WITH HILARY? CL: Hilary is the real deal. Not only did she deliver a wealth of information geared towards the specific challenge we were facing with Ponderlily, she kept her sessions very targeted, and yet sent across supportive emails throughout our time together. I know Hilary is busy but she was accessible and genuinely wanted to help us. She completely customized her signature branding program to suit our needs. She also sent me thought-provoking ‘homework’ and had me put in work to answer very tough questions about our business. When you work with Hilary, you will literally have a Marketing Executive on your team (and who also remains on your team cheering you on even from afar, by the way) working with you. CL: Ponderlily stands for the strength and beauty that comes from grounding resolve. I’m passionate about creating sustainable products for sustainable schedules so you can expect us to continue to make meaningful, elegant, and ecofriendly productivity tools in the future.